Scheduling our trade show attendance is always a challenge. We like to be consistent. We know especially with jewelry, store owners need to see and touch our offerings so they can make their choices. Our clients must see us at the trade shows. We choose to do the same shows over and over again …when we can. Unfortunately it is impossible for us to be in two places at the same time. And often trade show producers schedule shows at the same time. Date conflicts started happening with the New York Now (aka New York Gift Show) and the Las Vegas WWIN & Magic shows a few years back. Given the choice we opted for NY. NY Gift has always been our strongest show. We lost our WWIN location. During one of these seasons, we opted to add San Francisco Gift to our schedule. (It had been off our radar for a few years.) Turns out when Magic/WWIN is not conflicting with NY Gift, it is conflicting with San Francisco. Once back at the SF show, we stayed. Regional shows are important to us. Dunitz consistently exhibits at Chicago Windy City Gift, (Windy City Gift which has now taken place three times. Dunitz has been there twice. Previously we were seen at the now defunct Merchandise Mart show. 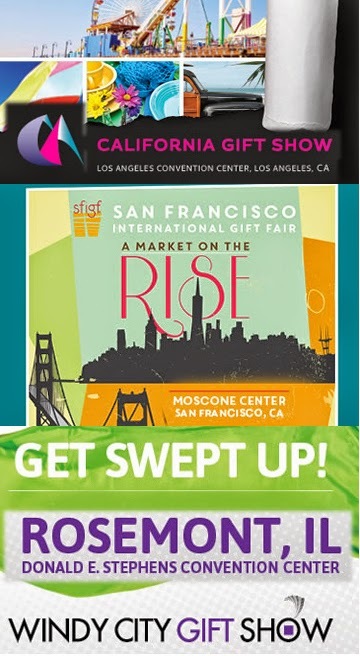 ), San Francisco Gift, Los Angeles Gift and Boston Gift shows. In fact, these shows are now all owned by the same trade show operator, Urban Expositions. When we are consistent, our steady customers see us time and time again and almost always in the same spot. Autopilot! Guess what? It isn’t. Even though Urban Expositions owns all of these regional shows, they often have their shows conflict with one another. Last season we had to opt for Chicago over Los Angeles because both shows were staged the same weekend. It was a close call, but next season we’ll be in Chicago over San Francisco….and unfortunately NOT in the same spot by the bathrooms :(. As an exhibitor – these choices are quite challenging. The Chicago team was expecting us to sign summer contracts by February 10th. How could we do this when we hadn’t been able to evaluate the San Francisco show which only concluded two days ago? Chicago management had indicated they would accommodate Dunitz by holding our space until the SF show concluded. Since we do so many Urban Exposition owned shows we believed they would give us the time to make the best decision for us. When we notified them yesterday we decided to return to Chicago, we learned they gave our booth to another exhibitor. Again – we won’t be by the bathrooms. We’re not sure where we’ll be as of this writing.